Registrations are still open for the new EUCROF webinar “Doing More with Data: Data Anonymisation and Pseudonymisation under the GDPR” that will take place on 17 April 2019. The webinarwill describe pseudonymisation and anonymisation techniques, specifically for clinical trial data, and how these fit within the GDPR regulatory framework. Many organisations are trying to exploit more value from their data to improve their products and services as well as to offer new ones and optimise their own internal operations. With the General Data Protection Regulation (GDPR) in place, these organisations need to determine the lawful basis for such activities. De-identification techniques, such as pseudonymisation and anonymisation, can play an important role in facilitating such secondary uses and disclosures of data. The webinar will be held by Khaled El Emam Founder, General Manager, and President of Privacy Analytics and is organised within the Events&Training working group of EUCROF. This Working Group (WG) has been launched with the aim to strengthen both events and training in the light of the educational vocation of all the activities EUCROF offers to its associates and external stakeholders. Donato Bonifazi, Chief Executive Officer at Consorzio per Valutazioni Biologiche e Farmacologiche, is the chair of the WG that intends to deliver activities to build relationships across organisational boundaries as well as to give training staff the opportunity to develop skills, expertise and grow within their role. For more information about the webinar and for registrations, click here. PharmaSich, CRO in Eastern Europe headquartered in Kiev, will organise the 2nd Kiev Clinical Research Forum that will take place on 16 – 17 May 2019 under the patronage of EUCROF. Martine Dehlinger-Kremer, President of EUCROF, and Sergii Myronenko. CEO at PharmaSich CRO, are part of the Organising Committee of the event, that will bring together international experts from pharmaceutical/biotech companies, CROs, academia and regulatory agencies. This edition will see the participation of over 60 speakers representing pharma companies, CROs and academia coming from Europe, US, Israel. Donato Bonifazi, Chief Executive Officer at Consorzio per Valutazioni Biologiche e Farmacologiche and chair of the EUCROF Events and Training Working Group will participate in the meeting as speaker, explaining the importance and the role of the research infrastructures on the current scenario of the preclinical and clinical research and the possibility of CRO partnerships in this context. The overall aim of the meeting will be to share views and knowledge on clinical research among all the participants, providing networking opportunities and an adequate discussion moment between speakers and audience. More information and the agenda of the meeting is available at this link. We are very pleased to announce that the #wecare_ye project, coordinated by CVBF and funded within the European Programme Erasmus+, started in January 2019 with the aim to foster youth active participation in the field of Health and Wellbeing and support actions for the promotion of youth groups exchange in Belgium, the Czech Republic, Greece and Romania, based on the model of what has been achieved with the first Italian and Albanian Young Persons Advisory Groups, respectively named KIDS Bari and KIDS Tirana. Within this project, the partner organizations have selected 5 people per country (25 participants in total), aged 13-18 years, chosen among youngsters involved in their local activities: young patients, patients' relatives, youngsters interested to health in general. Moreover, each national group will be supported by one group leader per country, preferably under 30 years, selected among staff members. These youngsters involved have expressed a common need to gain a better knowledge on Health issues, in order to better influence their social and political environment. The project will act on 3 levels - knowledge, empowerment, engagement. KIDS Bari and KIDS Albania, born in 2017, include youths (both patients and healthy teenagers) actively involved in the definition of key issues and questions in the paediatric research projects as well as in the communication and sensitization activities about the healthcare by consciously using the social networks. Since the launch of these initiatives, the members of KIDS Bari and KIDS Albania have been providing a fundamental support in advising researchers in a full range of international initiatives to promote paediatric drug development. More information is available here. General, non-pharmacovigilance fees payable to EMA by applicants and marketing-authorisation holders are increasing by 1.7% on 1 April 2019. Every year, the European Commission adopts a regulation adjusting the fees payable to the Agency with reference to the inflation rate in the European Union for the previous year. The 2018 inflation rate was 1.7%. Full details of the new fee levels are available in Commission Regulation (EU) No 2019/480 amending Council Regulation (EC) No 297/95, its implementing rules and the corresponding explanatory note on fees, published on 1 April 2019. These documents include the new fees for all types of procedures handled by the Agency, except for pharmacovigilance procedures. For annual fees, the anniversary date of the decision granting the marketing authorisation defines the applicable fee and consequently a new fee will be applicable at the time of any anniversary on or after 1 April 2019. In addition, access to SME incentives for regulatory consultancies has been clarified (human and veterinary medicines). Fees charged for pharmacovigilance procedures in accordance with Regulation (EU) 658/2014 are expected to be revised in 2020, taking into account the 2018 and 2019 inflation rates. 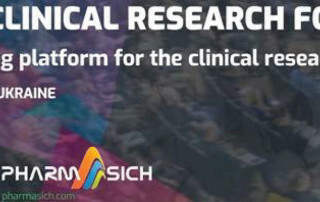 PharmaSich, CRO in Eastern Europe headquartered in Kiev, will organise, the 2nd Kiev Clinical Research Forum that will take place on 16 - 17 May 2019 under the patronage of EUCROF. Martine Dehlinger-Kremer, President of EUCROF, and Dr. Sergii Myronenko CEO at PharmaSich CRO, are part of the Organising Committee of the event, that will bring together international experts from pharmaceutical/biotech companies, CROs, academia and regulatory agencies. This edition will see the participation of over 60 speakers representing pharma companies, CROs and academia coming from Europe, US, Israel. Donato Bonifazi, Chief Executive Officer at Consorzio per Valutazioni Biologiche e Farmacologiche and chair of the EUCROF Events and Training Working Group will participate in the meeting as speaker, explaining the importance and the role of the research infrastructures on the current scenario of the preclinical and clinical research and the possibility of CRO partnerships in this context. The overall aim of the meeting will be to share views and knowledge on clinical research among all the participants, providing networking opportunities and an adequate discussion moment between speakers and audience. More information and the agenda of the meeting are available at this link.